Disclosure: I was provided with promotion product in exchange for sharing about this upcoming theatrical release. All views shared are mine and mine alone. Anyone who knows me, knows that I am a huge animal lover, especially dogs. When I was little we had a little white fluffball Maltese who was named Toby. My Mom came up with the name by taking letter from my every in my family's name to make the name -- "T" for my older brother Todd and father, Robert, "O" for my Mom's name Donna, "B" for my name, Robin, and "Y" for my other older brother's name, Ryan. Toby lived a long, happy life, and made my childhood growing up with a dog even more special. And, once I moved out on my own, I began rescuing dogs with my husband, and giving them a forever home that they deserved. Pets give us unconditional love expecting nothing in return, but really do so much more and deserve the very best life possible. That is why I have rescued four dogs since moving out on my own. 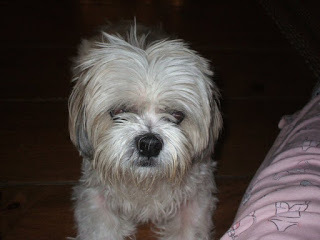 We started with Manny, a Lhaso Apso mix that was particular with who he let get close to him. He had skin allergies and kept getting overlooked at the shelter. But, once my husband and I laid eyes on him, we knew he was the dog for us. And for 7 years we gave him the best life possible, until he passed away due to complication from his severe skin allergies and the steroids he had to be on. Our next rescue was a Papillon Mix named Abby. 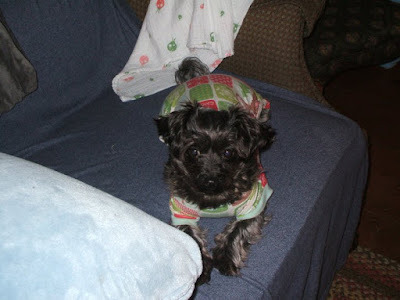 We ended up getting her right before I started my cancer treatment in 2008. I was going to be staying with my parents who lived closer to Dana Farber, and thought a dog would be a great distraction to my cancer journey of radiation and chemo ahead. Little did I know the true power of pet therapy. Abby got me through some dark days, and stayed by my side through it all. She would be waiting by the door waiting for me to return from treatment, and then would snuggle up next to me when I made my way to the couch or bed. 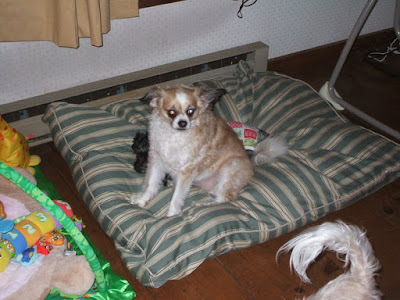 And, when treatment was over, we came back to CT where my husband and Manny were waiting for us. Manny provided the companionship and support my husband needed while I was away battling cancer, and he stayed back to work and pay the medical bills and mortgage of the house we bought a few months prior to my cancer diagnosis. Like I said, Manny was very particular with who he liked - both people and animals -- but, he knew that Abby was part of our family and would let her lay next to him. I was hoping that they would play, but Manny was getting up there in age and not doing so well with his skin allergies, so we decided to rescue another dog, which we did at Christmas in 2008. We ended up driving all the way to Stratford, CT hoping to adopt a Maltese I found on an animal rescue site. But, when we arrived, the dog we wanted was already adopted. I didn't want to leave empty handed as they were doing an adoption marathon in hopes to clear the shelter for the holidays. 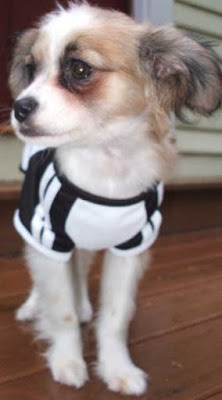 My husband and I partial to small dogs and couldn't find any that stood out. As we walked away, we gave one more glance back and that is when Lilly walked out from behind two bigger dogs and gave a bark. My husband and I looked at each other and knew that was our new furbaby. We brought her home, and she and Abby became best friends and were inseparable. Unfortunately, Abby wouldn't live that long as she developed seizures and one seizure left her paralyzed, so we had to put her down. She was only four years old. Poor Lilly was lost after her sister and best friend passed. She would just lay on the couch and not do much. It was difficult after losing Abby, and then a year later we had to say goodbye to Manny. We loved our dogs like they were our children and treated the as such as we didn't have any children of our own yet. 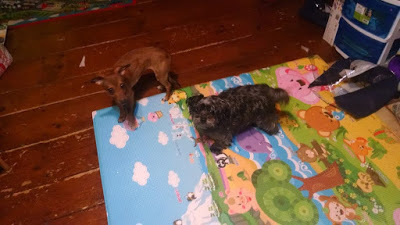 Even though we wished Lilly had another dog to play with, it was hard for us to think about rescuing another dog. We waited 6 years to rescue our fourth dog, Milly. 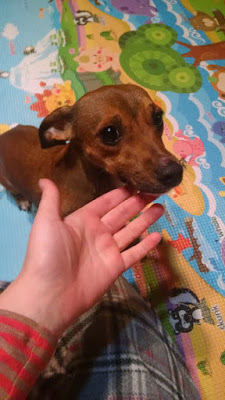 Like Lilly, I went to the shelter expecting to rescue one particular dog, but when I found out that Buttons had skin issues like Manny, I knew my husband and I couldn't go through that again with another dog. It was so hard seeing Manny go through that and needing a dog collar for the final year of his, as he would bite and create wounds trying to get relief from his skin allergies. By this time, I had my two daughters with me, and they were all excited to get a dog of their own. Lilly was too old for them and didn't play with them they they imagined a dog would. So, I looked at the different dogs the shelter had. There were some really nice dogs, but none that stood out. That was until the shelter lady told me about Milly and how she was returned twice and was on her final few days at the shelter before she would be put down. I couldn't bear to see a dog be put down as it was abused previously and others couldn't handle or put the time in to help rehabilitate her. So, I said I would take her. It took a while for Milly to warm up to us, as she had a rough go before she was rescued. She was found with an electrical cord around her neck, beaten and with bones showing, on the streets of NYC. Milly has become my buddy and when I look at her I see a little of each of the dogs we have rescued to date. She has the temperament like Manny in that she only likes a select few people, the sad face like Abby had, and the wish for a best friend like Lily had when we rescued her and she came home and bonded with Abby. My dogs over the years have helped me through difficult times, and been there during the good times. They have made some of the bad days good by a simple lick, or snuggle. And, it amazes me with each of our dogs, that with all that they have been through as they were all abused prior to winding up in a shelter, that they have opened their hearts and less my family and I love them, and providing us with countless kisses and snuggles, even when we are having a crazy day and may overlook them. Every night when I go to bed, Lily, who is now in heart failure, sleeps at my feet, and Milly snuggles in my arms like a baby doll, and we all go to bed. 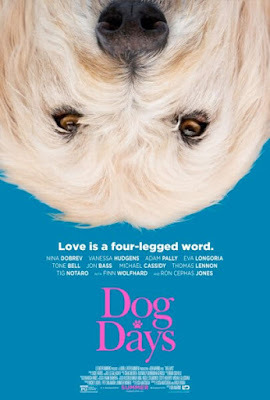 If you are a dog lover like I am, then you will want to make a point to see Dog Days, a heartwarming movie all about dogs and humans and how their paths meet and intertwine. This movie reminds us to treat people, and animals with kindness and compassion, and shows us how by doing this our lives can change in ways we have never expected. My life is so much better thanks to my rescue dogs, and I owe so much to them, more than they will ever know. I can't wait to bring my family to the movies to see this movie. We have all seen the trailer, and our hearts melted when we saw all the cute dogs. My girls are counting down the days, and I am getting excited about this August 8th movie release, too! Here is more about this cute movie, that will steal your heart with all the dog cuteness overload, when it arrives in theaters on August 8th. 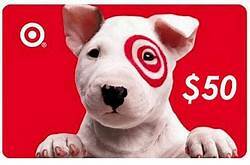 And, be sure to read on to learn how you can enter to #win a $50 Target Gift Card to pick up treats and gifts to pamper your pup(s) and show them just how much they mean to you, and how much you appreciate their unconditional love, day in and day out. 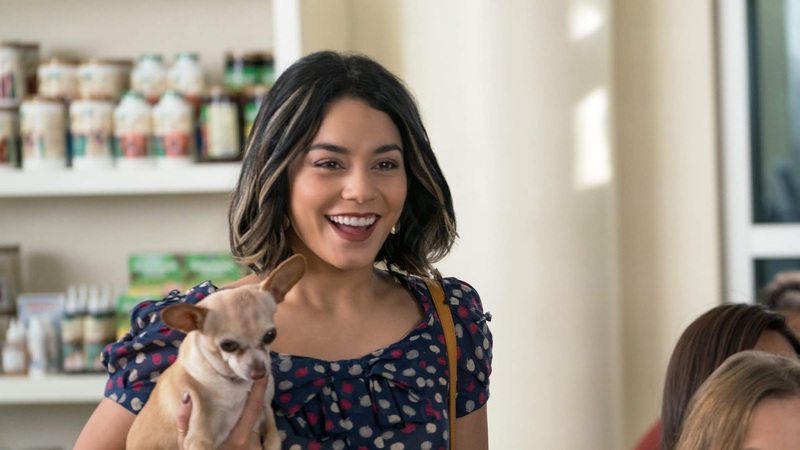 "DOG DAYS is a hilarious and heartfelt ensemble comedy that follows the lives of multiple dog owners and their beloved fluffy pals. When these human and canine’s paths start to intertwine, their lives begin changing in ways they never expected. This is a sweet film about the joy our furry friends bring into our lives and what they can teach us about treating people with kindness and compassion. DOG DAYS releases in theaters on August 8th." I entered the Townely girl giveaway!